The beauty ideal: June Favourites. I can't believe June's nearly over already. I feel like every time I blink another month goes by. Unfortunately, the end of June has been pretty sad for me since I had to say goodbye to a dear old friend. My beloved kitty passed away this past Saturday so an honorary mention goes out to her - but she doesn't need it, she'll forever be my favourite. 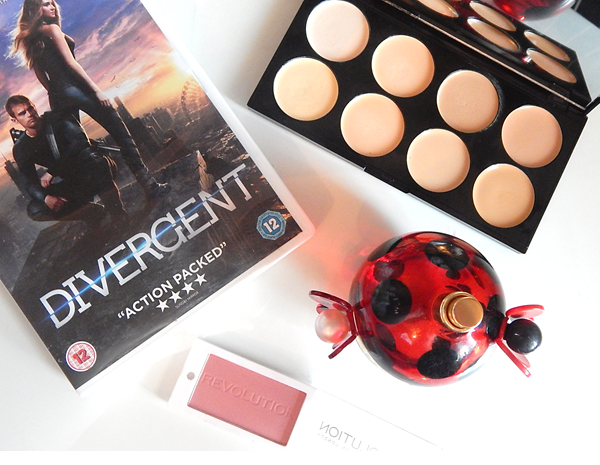 First up is Makeup Revolution's Ultra Cover & Conceal Palette (£6.00). I'm still in awe at the price of this. I've been using it daily to gain that Kim K highlighted look (though not that dramatic) and it's great because even when I'm self tanning it goes dark enough for me to still be able to get use out of it. I recommend wholeheartedly. Secondly is another Makeup Revolution fave (I know, I know) and that's their Single Powder Blush in Sugar (£1.00). £1.00 though?! Makeup Rev, you kill it! This shade is the perfect colour for any skintone and adds just the right amount of rosiness without looking clown-like. My scent of the month has been Marc Jacobs' Dot (£67.50 for 100ml). My Mum picked this up for my birthday back in April and I've only really just got into using it. It's a glorious mix of jasmine, vanilla and musk and it's one of my favourites from the Marc Jacobs range. I also love all of his bottle designs - though they are a nightmare to travel with. Lastly has been a film fave and that's Divergent. I loved the book series and I was holding out hope for the films, and I'm pleased that I enjoyed Divergent. I've yet to watch Insurgent but I'm holding it in good stead also. Not to mention Theo James is beautiful and I ship Four and Tris so much, so much. I love Divergent too! Insurgent is amazing you will have to watch it some time!